There is 1 review for 'Alvastia Chronicles'. First of all, I would like to thank Kemco for these amazing RPG’s. To me, being an 80’s kid growing up with the classic games in the 90’s, these games are top notch by almost all accounts. I would also like to point out that even though I only started playing Kemco games in 2017, the company is now on my top 5 list of RPG developers. Okay, now, to get on with it. I am sorry if this review is both short and lacking detail, but I will give the honorable mentions, the good and bad, as well as what I personally got out of the game. So far out of the 10 Kemco games I have mastered, I really enjoyed Dragon Sinker most as it is my favorite thus far. Alvastia Chronicles is a wonderful world in which you can freely explore without having to physically travel to do your back tracking via map screen. This makes it easier to get what you need done. There are multiple locations in which you can traverse (like the other titles). Alvastia Chronicles gives you the option to recruit up to 100 companions for your custom team and take on anything with your own setup. In this game, you obtain 2 other forms of transportation as you are eventually able to explore without restrictions. The game is beautiful and the characters although are not the most memorable, but had their moments (Gil for example). While playing Alvastia Chronicles, you will be able to occasionally find Old Chests after battle and set them in a menu (much like the garden feature in other Kemco games). The Old Chests have four rarity types which are straight forward (one to four stars) and can take up to 2 hours to get results. If you do not wish to wait for the chests to open, you can buy Old Keys in the shop menu, or obtain them within the game’s progression. 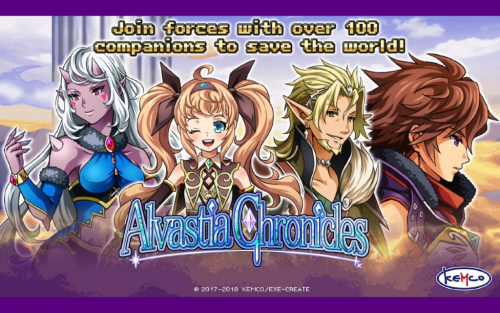 Much like Dragon Sinker and a few other titles, Alvastia Chronicles gives you the three main battle teams and the game lets you select three allies to recruit to each. The battle system is much the same as most other titles, but you have a “Burst” option where you can have one member from each team to initiate an action. Setting up your team just right will help you pull off powerful combos. While the battles in this game specifically are very easy on all modes compared to most other Kemco titles, it is still very fun to level grind and collect content as well as party buffing items that are very common. While I was only familiar with the Maid aspect of most other Kemco titles, the Butler aspect for this game was much the same, and you can test your medal in the tournament, plus the hidden tournament. You can get 100% game completion in under 20 hours, so the game doesn’t have much to it at all. Despite being very short, the game is overall a good one. I personally enjoyed it, but it was a bit too easy. I don’t know if there is an Alvastia Chronicles II out there, or a spin-off, but I for one would sure play it. This is my very first public review of any game, so it may not be as thorough to some readers who require more content. Anyway, I hope this was at least decent for those who have not yet played Alvastia Chronicles, or would like to know a bit more about it. Thank you, everyone and I look forward to any, if at all input you might have. Normally when you complete a Side Quest (SQ) in this game, the Relay Stones will automatically resolve the quest for you and let you claim your reward through the Side Quest menu, but in the case of the SQ #17 to #20 dilemma, you have to physically travel to those three clients to activate the next quest. (this is my best guess as that’s how it worked for me). Easy and Relaxing Level Grinding fun where you can enjoy traveling without much worries. HP and Status is fully Restored After Each Battle. The Companion Feature is Fun, and meeting their requirements for recruitment keeps you compelled. Wide Exploration that is easy because of the warp option on the map screen. While the Storyline is fair, the characters lacked... well, character. Treasure chests found are mostly items that you don't use often enough, so treasure hunting wasn't anticipated much. The Butler feature was very dull and didn't have much to it's mechanics. All Medal Effect, Spoiler Alert ! !